It is coming up on a couple weeks now that I have moved back home from California, and back from the most incredible summer/ time of my life. I seriously can’t even believe it is already the end of August! Am I the only one feeling like summer went by way too fast?! JEEZ, where the heck did the time go?! I mean seriously, I am about to start my very last year of college! Talk about time flying by! Speaking of this adventurous, overwhelmingly awesome, dream pursuing summer, I just wanted to fill you in on how God really crafted my heart over the last few months. If you didn’t already know, I had an internship in San Diego planning events and weddings for the summer! I lived in my most favorite part of the U.S., with the most amazing family, working with a remarkable team of people, getting a small taste of what life in my dreams actually feels like. Overwhelming, yes. Long days, yes. But to me, each one of those days felt like I was on a vacation. I was traveling to a new beach, learning to surf, finding that new hidden coffee shop, trying new food, or hiking to the next best spot everyday. Don’t get me wrong, the first couple weeks of doing all of it alone was nothing short but tough, yet looking back now, doing it solo was the key part of his master plan! There is so much positivity that comes from taking the time for yourself. In that alone time, it gives you a chance to hear him more clearly, and see his picture of what he has boiling in the pot for your life, and your purpose! 1. Have you ever heard of that song by Zac Brown Band, “Knee Deep?” One of the lines in that song says “mind on a permanent vacation,” and that is exactly the mind set I have come home with. Being able to enjoy wherever you are, and taking each day as a new exploration. Happiness can most definitely be a mind set, and even though it is W A Y easier said than done, it is possible, I can promise you that. I want my everyday life to always feel like i’m on vacation, don’t you?! 2. When I came back from Africa, I fell in love with journaling. Waking up and spending a couple extra minutes soaking in his word, and journaling about what is in store for the day, acts as a small reminder as to what direction you want to be headed in. Also, he will talk to you if you’re listening!!! Oh the moves he will make, when you open up your heart. 3. Turing that anxiousness into excitement. This is huge. For me my anxiety stems from trying to think too far into the future and worrying about the things I want to happen, and the “what ifs” if they don’t happen. I have these exuberant goals and ideas for my life, and so much that I want to accomplish, that I overwhelm myself with it all. Put your hands up if you feel me, RIGHT?! But when you feel that happening, try to think of it as excitement, and write it down. See it as the awesome future that you are going to make happen, and all of the great things coming. 4. S T R I V E F O R P E A C E. Some things you just can not change. I know its hard to believe, but it is out of your hands. To all of my worriers, s t o p! God has you. Trust him. If you can find peace in the little things, you will discover so much lurking joy. 5. G O! Go do the things that you dream about and go to the places you want to go. Find a way to rid yourself of the excuses. Go out of your way for other people and go out of your way for yourself. Hike that mountain, take that road trip, find that beach. MAKE IT HAPPEN! Hoping you find that permanent vacation in your next school year, new job, and life. This outfit is all from Brandy Melville. Super simple, yet a great way to throw on a cute piece that you can dress up or down. 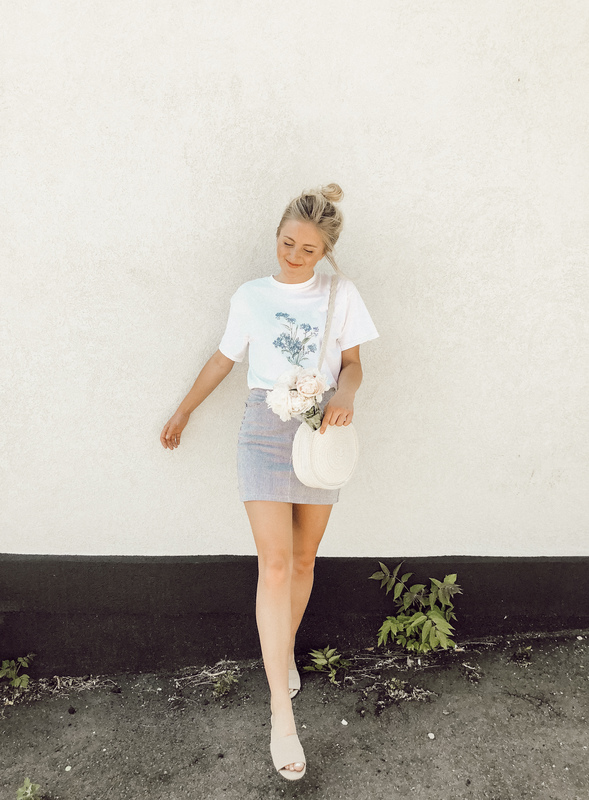 I’m a huge sucker for graphic tee’s recently because there are just so many different ways to wear them! From tucking it into some slim jeans with heels, or being that little cutie running errands with some shorts and sneakers! This is so good. I needed this. You are great, really great. Keep up the good work, keep inspiring.